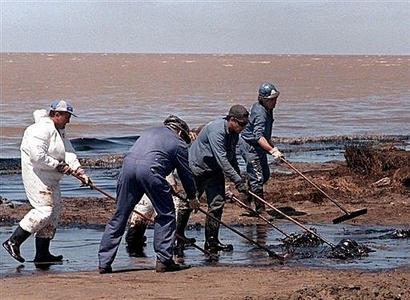 The BP Oil Disaster Might Help the Economy, but Does That Matter? The Gulf of Mexico oil disaster may, believe it or not, give a boost to our ailing economy. Because while the six-month moratorium on new offshore drilling and the negative impacts on fishing and tourism in the Gulf will undoubtedly put a damper on the GDP, the temporary industry of cleanup workers could offset any losses–and perhaps even outweigh them. Does it matter? The six-month moratorium on deep-water drilling may cut U.S. oil production by around 3% in 2011 and cost more than 3,000 jobs, according to J.P. Morgan’s energy analysts. Commercial fishing in the Gulf is also likely to suffer, but that’s only about 0.005% of U.S. GDP. The impact on tourism is the hardest to measure, although it’s fair to expect that many hotel workers who lose their jobs will find it hard to get new ones. Still, cleaning up the spill will likely be enough to slightly offset the negative impact of all this on GDP, J.P. Morgan said. The bank cites estimates of 4,000 unemployed people hired for the cleanup efforts, which some reports have said could be worth between $3 and $6 billion. We need only take a look at the last major oil disaster in the United States to see the inadequacies of the GDP as an accurate economic indicator. The 1989 Exxon Valdez oil spill raised the GDP by $2 billion thanks to intensive cleanup operations–but this doesn’t take into account the long-term environmental damage in Alaska, which can still be seen today. The Gulf Coast has even more of a fishing and tourism-reliant economy than the areas affected by the Exxon Valdez. So take reports touting the economic benefits of the BP disaster with a huge grain of salt–any positive effects are only temporary.